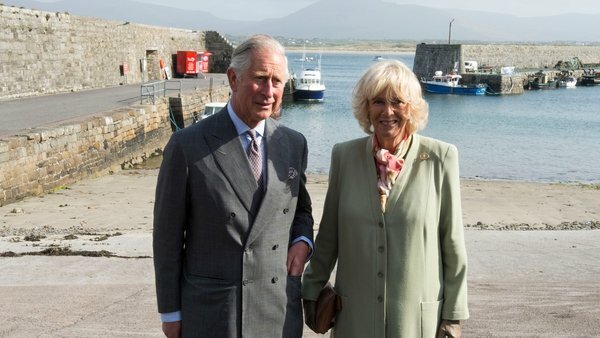 Britain's Prince Charles and his wife Camilla have concluded a whistle-stop trip to Co Donegal a year after his visit to Mullaghmore in Co Sligo where his great uncle Lord Mountbatten was murdered by the IRA in 1979. They were shown around the walled garden and pleasure grounds by Glenveagh's head gardener, who told them about Glenveagh's involvement in conservation programmes. Earlier, the British royals arrived in Donegal town at around 11am amid tight security. They were welcomed to Donegal Castle by Irish dancers and musicians and toured some of its restored rooms and the banqueting hall before walking through the town. Several hundred people, including local schoolchildren, surrounded the Diamond in the town centre for the visit. A security cordon was placed around the town for the visit with all those hoping to greet the royal couple being screened. They stopped at the Obelisk commemorating the Four Masters who wrote the first history of ancient Ireland in the 1600s. The couple also spent time meeting locals, and called into a renowned local butchers, McGettigan's, where they met owners Ernan and Diarmuid, who offered them samples of their award-winning sausages. 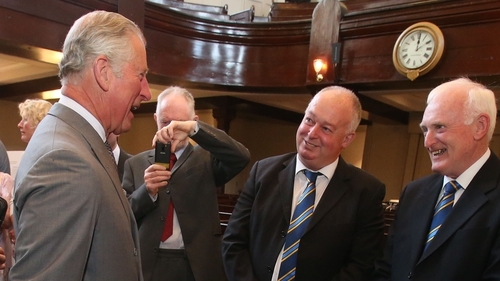 Prince Charles attended a civic reception at Letterkenny Institute of Technology this afternoon, where he met Minister for Foreign Affairs Charlie Flanagan. Prince Charles arrived in Northern Ireland on Monday for a series of civic engagements and was joined by his wife yesterday. The Duchess of Cambridge this afternoon visited Ballyraine National School in Letterkenny, where she enjoyed a musical performance from young students, and was given a tour of the school's facilities. A hen house in the school was renamed Cluckingham Palace in honour of the visit. There was a small protest in Donegal town as Prince Charles and Camilla arrived.